Fire up the grill for the sweet and spicy flavors of the southwest in omega-3 packed bites – sweet chipotle salmon! One of the best things about the summer is how the grill becomes the center of parties, conversations and lasting memories. In fact, the grill can make or break a party. It may even be an unspoken rule that a party during the summer seasons is not official if your grill is not fired up in the backyard – then it’s just a meet-up. So, if you’re not a BBQ Pit hero just yet, no worries – I’m not either. And the good news is you don’t have to be. Just keep it simple and high in flavor. If you don’t have a wooden plank to grill your salmon on – or you’re simply pressed for time – use foil! But not all foil is the same since some require that you grease it first. That’s why I’m proud to partner with Reynolds Wrap Non-Stick Foil! I’ve actually been using this product for years in many recipes since I do not have to grease the surface before using. It’s perfect for calorie-conscious cooking so you can dodge those extra calories from added oil. Plus, the skin and sauce from the salmon lifts right off so you get ALL the flavor! And if you’re feeling confident, toss some avocado halves on the grill too and stuff it with this sweet & spicy salmon…aaaaand topped off with your favorite salsa. This is a satisfying, energy packed treat al by itself. You’ll be the MVP of the summer party. Bet. Fire up the grill to about 350F/177C in temperature. Tear off a long sheet ofReynolds Wrap Non-Stick Foil – about twice the length of the salmon – and fold it in half. Place the salmon on top and season with garlic, lime zest and pepper. Fold in the sides of the foil and then the top and bottom in order to seal it closed. Place on the grill for 6 to 8 minutes. Mix together the ingredients for the sauce. Season to taste with lime zest, pepper and sea salt (if needed at all since chipotle pepper sauce tends to be salty). 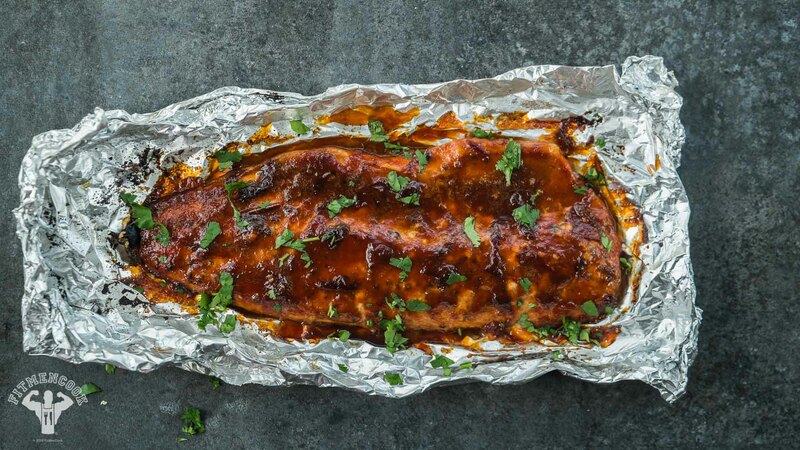 Take the salmon off the grill and open up the foil. Reduce the heat of the grill to low )around 180F) and set it to “smoke,” or add some soaked wood chips to the coals so it begins to smoke. Drizzle the sauce on the salmon, then brush it all over the salmon. Leave it open and place it back on the grill. And if desired, and hopefully it is, slice open ripe avocados, remove the pit, then place the avocados face down on the grill. Smoke for 10 to 15 minutes and baste with a brush every 5 to 6 minutes. Remove the avocado halves after about 5 minutes or after they have grill marks on the flesh. Remove the salmon from the grill once it is cooked to your desired readiness and garnish with a little cilantro (and lime). Flake the salmon with a fork then stuff it inside the grilled avocados. Top it off with your favorite salsa. Add sea salt and pepper to taste.